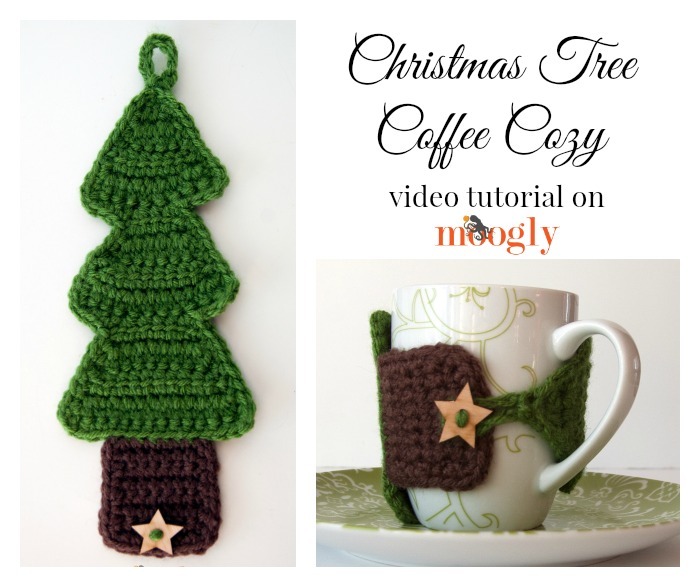 #Crochet Video Tutorial: #Christmas Tree Coffee Cozy! 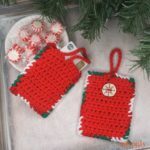 Last holiday season I designed the Christmas Tree Coffee Cozy – the perfect quick pattern for the coffee (or hot cocoa!) lovers on your gift list! Paired with a gift card to your local coffee house, it’s a fun present to give and receive. But it does have a couple unique moves, so this year I’m sharing the video tutorial! I hope that this video tutorial has helped clear up any confusion on this pattern! For more info on linked stitches, check out the Linked Double Crochet tutorial. And if you’re just not getting the hang of linked stitches, feel free to substitute regular double crochet stitches! It won’t be quite as solid a fabric, but it’ll still look great. And one other note – lots of people prefer to put the loop on the trunk, and the star on the top of the tree. My own reasoning for doing it with the star on the trunk was that this way you can hang the tree up by the loop if you like, and the star would be at the top of the green loop when it’s in use. However, I’ve seen it done both ways now, and they both work, so if you prefer the other version, go for it! And feel free to decorate the heck outta that tree too – have fun with it! Thanks so much for watching! Get Moogly on your favorite social media sites: Facebook, Twitter, G+, Pinterest and Tumblr, and sign up for the Newsletter so you don’t miss a thing! Moogly is on Instagram now too! Tamara, the written pattern of this w/the Ext dc sure had me totally stumped, some things I just have to see and this was one of them. Thank you so much for making this video, it’s really easy now that I’ve seen you do it! Great pattern!